As the cradle of the car industry, Michigan built out its cities and suburbs exclusively for the automobile after WWII with a fervor that few other states could match. Today the pendulum of public preference is swinging back toward walkability, but much of Michigan’s housing stock is stuck in the old model. Just 8 percent of homes in the state’s seven principal metro areas are in walkable places, and just 4 percent of homes built since 1960. Meanwhile, Michigan also leads the country in job sprawl, with 77 percent of Detroit-area jobs located more than 10 miles from downtown. These patterns aren’t going to last forever, though. 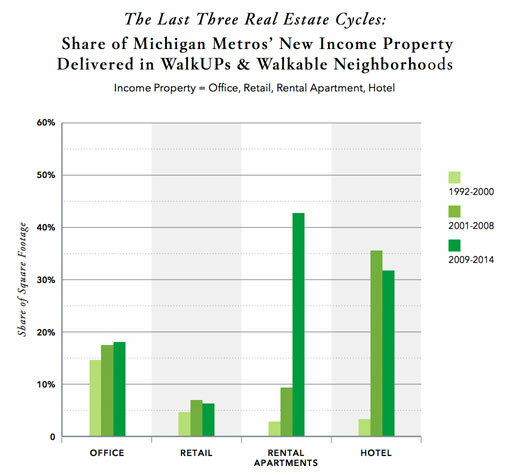 A new analysis of walkable development in Michigan by Chris Leinberger and Patrick Lynch of the George Washington University School of Business (in conjunction with Smart Growth America and its real estate developer caucus, LOCUS) shows that things are changing [PDF]. In the 1990s, only 6 percent of new income property development occurred in walkable urban areas. Now, that number is 22 percent. The seven metros analyzed were Detroit-Ann Arbor, Grand Rapids-Muskegon-Holland, Lansing, Jackson, Kalamazoo-Battle Creek, Saginaw-Bay City-Midland, and Flint. Apartments in Michigan’s walkable urban areas rent for 28 percent more than in driveable suburban areas. The premium on walkability is greater for home prices, which are 56 percent higher in those walkable urban places. The data doesn’t show as much pent-up demand for walkability in the commercial and office sector, which indicates that the job sprawl that forces people into long commutes may not be ebbing. Walkable office space rents for just 2 percent more than in driveable places. These premiums aren’t as great as in other metro areas Leinberger has studied — including Washington, DC; Atlanta; and Boston — but are higher than many would have expected for Michigan. After all, it’s not on the coast, and it’s not a magnet for young, single “creative class” professionals. But in Michigan metros ranging from affluent college towns to depressed industrial areas, walkable development is on the rise.